These small quilts were selected to please demanding quilt lovers. Showing a diversity of patterns, styles, and colors, these quilts are all beautifully designed and very well constructed. Note how carefully each has been pieced and hand quilted. These quilts are the best of the best Lancaster has to offer -- they are far superior to the small quilts made as souvenirs for tourists. While small compared to a bed quilt, these wall hangings are still large in comparison with most paintings or prints found in homes. With their dramatic use of color and texture they can become the visual focal point of any room in your home. Consider lighting them as you would a fine painting. 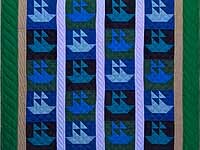 As with our larger quilts, these quilts are made one at a time in Amish and Mennonite homes -- they are not mass produced. We only have one of each to sell. 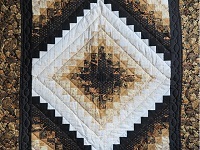 The small quilts listed below are available for immediate sale and when ordered will be shipped, almost always, no later than the next business day. 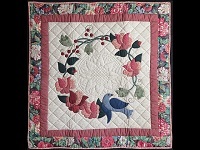 This page is updated when new quilts are listed or quilts sold. If you see a small quilt that you love, but it is the wrong size -- please contact us . 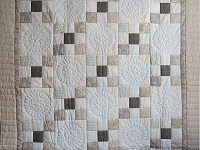 We can check to see if a similar well-made small quilt in the right size is available. We can also arrange for a small quilt to be custom made. 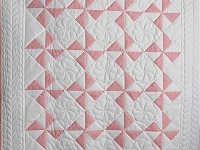 You may wish to receive our Quilt Alert email messages that we send out as we add new quilts. For more information and to sign up Click Here. 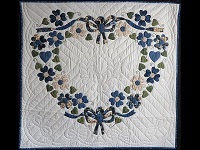 You can see all of the quilts we have photographed for you by clicking on any of the items listed in the navigation menu on the left side of this page. 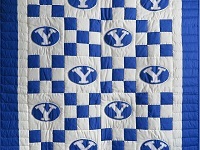 What a great quilt for someone special whose name begins with the letter "Y" or to celebrate your favorite sports team. The size would make a great wall hanging, crib quilt or small throw. 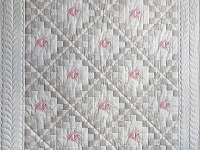 Amazingly tiny hand quilting is featured on this quilt. Each letter "Y" is carefully hand embroidered onto the patches. A tremendous amount of hand stitching has gone into this quilt! Very well made by a Lancaster County, Pennsylvania Amish woman. A traditional nine patch pattern in the beautiful colors of coral and white. The coral prints are delightful! Well made by Pennsylvania quilt maker, Connie Lapp, and nicely hand quilted by her mother. Sure to be a treasured heirloom. A classic Irish Chain made extra special with elegant, embroidered feathers. 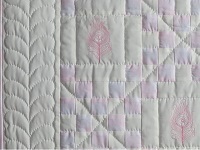 The pink fabric has subtle white feathers that perfectly coordinate with the embroidered feathers. 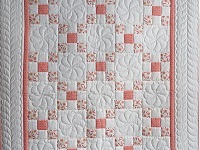 A soft, subtle colored quilt that is sure to be a lovely addition to any nursery. Well made by Pennsylvania quilt maker, Connie Lapp, and hand quilted by her mother. A classic Irish Chain pattern made extra special with elegant and dreamy embroidered horses. 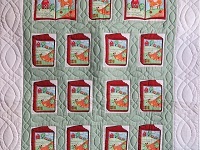 The colors of the quilt will look amazing in a modern nursery. The back of the quilt is covered with the same gray fabric as used on the front. Truly an extra special quilt for a very special new baby. Well made by Pennsylvania quilt maker, Connie Lapp. Hand quilted by a friend.